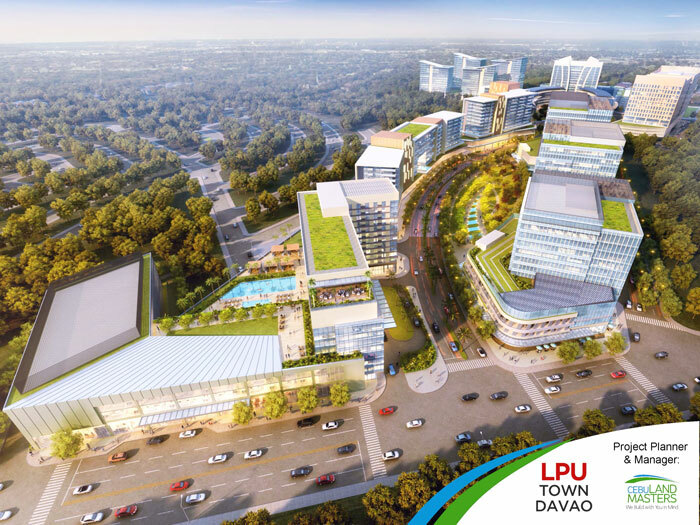 An architect’s render of LPU Town Davao, a 17-hectare mixed-use development that will have academic, residential, commercial, office, hotel and convention components. Owner LPU has tapped leading VisMin-based real estate property Cebu Landmasters to be the project planner and manager. Listed company Cebu Landmasters Inc. (CLI) expands its presence in the booming city of Davao by collaborating with globally competitive higher education institution Lyceum of the Philippines University (LPU) to develop the latter’s Davao campus into a mixed-use, and world-class University Town. CLI is signing a Memorandum of Agreement (MOA) with Lyceum of the Philippines University for LPU Town Davao, which is set to begin development by Q4 2018. It is a 17-hectare mixed-use development that has academic, residential, commercial, office, hotel and convention components. 5.2-hectares of which is dedicated for its LPU Davao campus including an academic resource center, a pool, dormitories, maritime center, and a football field inside this development in Buhangin, Davao City. Under the MOA, CLI will be the project planner and manager of this development. It will also bring its flagship brand Casa Mira Towers to LPU Town Davao. This will serve as a convenient housing option for LPU students, and those seeking to reside comfortably in Uptown Davao. CLI will also build phase 1 of the commercial component of LPU Town. “Our vision together with Lyceum of the Philippines University is to make LPU Town Davao a premier university township. CLI is truly honored to work with the higher educational institution that has produced esteemed graduates like our President Rodrigo Duterte who puts VisMin as a major area of priority for development.” said CLI Chairman and CEO, Jose R. Soberano III. “LPU is happy to partner with Cebu Landmasters. With their track record being the leading VisMin-based real estate developer, we are confident that this project will be what we envisioned it to be. We are proud to pioneer this University Town concept, starting with LPU Davao,” LPU Davao president Peter Laurel underscored. Located at Sun City Road, Buhangin, Davao, Davao del Sur, less than 10 minutes away from the Davao Airport, LPU’s Davao campus is the sixth addition to the LPU system which has campuses in Manila, Makati, Cavite, Laguna, and Batangas. The campus will be offering College and Senior High School Programs. LPU has been awarded by the Commission on Higher Education with a number of Centers of Excellence: Hotel and Restaurant Management (Manila and Batangas Campuses), Tourism (Manila and Batangas Campuses), Business Administration (Manila Campus), Medical Technology (Batangas Campus), Customs Administration (Manila Campus). It is also awarded with Centers of Development for Business Administration and Information Technology (Batangas Campus). Cebu Landmasters, the leading local housing developer in VisMin according to a recent survey by Santos Knight Frank, a top property consultancy firm, has ongoing collaborations in Davao City. The publicly-listed firm is in partnership with Davao-based real estate companies in the development of several projects: MesaTierra Garden Residences; The Paragon Davao, an emerging lifestyle development; and the Davao Matina Business Park, a CBD township project.